Freeform 25 Days of Gifts Sweepstakes – Win $25,000 and a trip to Disney World! Win $25,000 & a trip for 4 to Disney World! ENTER SWEEPSTAKES HERE – Freeform Sweepstakes page. Note: You will need a Disney account to enter – it’s FREE to sign-up for an account. ENTRY LIMIT – Entries are limited to one (1) Entry per person/email Address for each Daily Sweepstakes (except in the case of the Grand Prize Sweepstakes which includes a carry-over of all eligible Entries for the preceding 24 Daily Sweepstakes), regardless of method of Entry or whether one person has more than one Address or more than one person use the same Address. ELIGIBILITY – Open only to persons, who are, as of date of entry, sixteen (16) years of age or older, and who are legal residents of, and physically located within, the 50 United States or D.C. SWEEPSTAKES ENTRY PERIOD – You may enter this Sweepstakes each calendar day (“Day”) during the twenty-five (25) day period beginning at 12:01am, December 1, 2018, and ending at 11:59pm, December 25, 2018. PRIZES – ONE (1) GRAND PRIZE (“Grand Prize”): Grand Prize winner (“Grand Prize Winner”) will receive a check for $25,000 and a four (4) day / three (3) night trip for Grand Prize winner and up to three (3) guests (individually, “Guest,” the Guests and Grand Prize Winner shall collectively be referred to as the “Group”) to Orlando, Florida (“City”) to visit Walt Disney World® Resort near City (“Trip”), consisting of the following elements for the Group:  hotel accommodations (one (1) standard room/quad occupancy, including room tax) for three (3) nights at a Walt Disney World® Moderate Resort hotel selected by Sponsor in its sole discretion;  four (4) 4-Day Magic Your Way Tickets with Park Hopper® Option;  one (1) day (7 hour) VIP tour guide;  if Grand Prize Winner’s residence is located more than two hundred fifty (250) miles from City, round-trip coach air transportation (with possible layovers) for the Group on a Sponsor-selected carrier between a Sponsor-selected major metropolitan airport near Grand Prize Winner’s residence (“Airport of Origin”) and Orlando International Airport; but if Grand Prize Winner’s residence is located two hundred fifty (250) miles or less from City, then air transportation or any other form of transportation will not be provided to the Group, and  round trip ground transfers between the Orlando International Airport and the Walt Disney World® Resort via Disney’s Magical Express coach service when air transportation is provided. If the Grand Prize is awarded to a nonresident of California, the Grand Prize will also include an estimated cash amount of $2,527.93, which will be withheld to defray payment of California nonresident withholding tax payable as a result of winning the Prize. ARV (if Grand Prize Winner is a resident of California): $36,113.32, or $38,641.25. Travel must be taken between January 15, 2019 and December 31, 2019. SEVENTY SIX (76) DAILY PRIZES: Daily prize winners (“Daily Prize Winner”) will receive one (1) daily prize (see rules for a chart of the daily prizes). WINNER’S LIST – For a Winners’ list (after February 28, 2019 and before March 31, 2019) and/or Rules (before December 25, 2018), send a self-addressed, stamped envelope to: 25 Days of Gifts Sweepstakes, Winners/Rules, c/o Ventura Associates, ATTN: HD, 494 Eighth Avenue, Suite 1700, NYC, NY 10001. 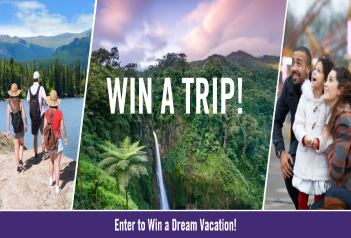 Bowflex Dream Vacation Giveaway – Win a trip worth $8,000! Win a trip to location of your choice (choose between three options: Disney World, Costa Rica or Keystone, Colorado)! ENTER SWEEPSTAKES HERE – Bowflex Sweepstakes page. ELIGIBILITY – The Bowflex Dream Vacation Giveaway (“Sweepstakes”) is open to legal residents of forty-seven states (47) of the fifty (50) United States and the District of Columbia, who are eighteen (18) years or older. SWEEPSTAKES ENTRY PERIOD – Sweepstakes begins at 12:01 a.m. PT on 5/7/18 and ends on 6/30/18 at 11:59 p.m. PT. Disney World: Includes (3) night (4) day, Air fare for up to (4) people, 4-day ticket with admission to (1) park per day, (4) people (2 adults, 2 kids); single room occupancy at the Disney hotel; Disney Deluxe Dining (Includes (3) meals per person, for ( 3) days, Quick service or table service; Dining experiences offered at select table-service restaurants include: Character Dining – Meet one or more Disney characters, Signature Dining – May offer renowned chefs, unique dining experiences and award-winning cuisine, Dinner Shows – Experience live entertainment and a delicious all you care to enjoy dinner). Also includes (2) snacks per person for (3) days, (1) drink mug per person, refillable at any quick service restaurant at your Disney resort hotel, ground transportation and travel insurance. Subject to blackout dates. Costa Rica: Guanacaste, Costa Rica. Includes (4) night stay at the Westin Playa Conchal Golf Resort & Spa for up to (4) people in one (1) Getaway Deluxe Junior Suite (all-inclusive) with (2) double beds; private transfer by land between Liberia, C.R. and Westin Playa Conchal; Air travel for up to (4) people; transfers and property taxes and travel insurance. Subject to blackout dates. Keystone, Colorado: at Keystone Lodge & Spa by Keystone Resort. Includes (3) night stay in (2) rooms (based on 4 adults) or (1) room for family of (4); Air transportation for up to (4) people; Ground transportation from airport to lodge; 2-day lift tickets for up to (4); Ski equipment rental for up to (4) people (brought to hotel); transfers, property taxes and travel insurance included. Subject to blackout dates. Approximate retail value of each vacation package not to exceed $8,000USD. 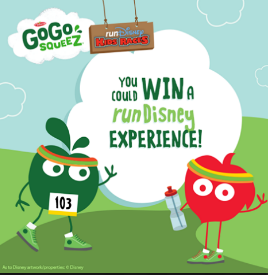 GoGo squeeZ runDisney Sweepstakes – Win a trip to Disneyland or Disney World & more! Win a vacation package for 4 to Disneyland or Disney World! the age of majority in the jurisdiction of their residence, whichever is older). SWEEPSTAKES ENTRY PERIOD – The Sweepstakes begins on or about 10:00 A.M. Eastern Time (“ET”) on 1/8/2017 and ends at 11:59:59 P.M. ET on 1/15/2017. -Four (4) round-trip coach class airfares between the gateway US airport nearest winner’s residence and the Orlando International Airport or John Wayne Airport. -One (1) standard room with a maximum of four (4) persons at a Moderate Walt Disney World® Resort Hotel or Disneyland® Resort for four (4) nights. -Four (4) 4-Day Magic Your Way® Park Hopper Tickets or its equivalent to be awarded to the grand prize winner and up to three Guests of the Proposed Promotion. -Four (4) runDisney Race entries during Walt Disney World® or Disneyland® Resort Weekend. Total Average Retail Value: $6,156.00, which will vary depending upon point of departure, selected destination and seasonal fluctuation of lodge rates and airfares. 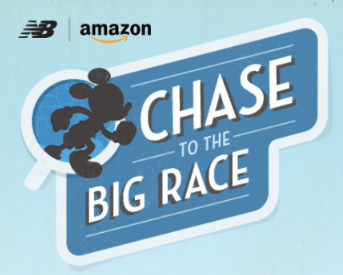 Amazon.com and New Balance “Chase To The Big Race” Sweepstakes – Win a trip to the Walt Disney World Marthon Weekend & more! Win a trip to attend the Walt Disney World® Marathon Weekend in Lake Buena Vista, FL, $2,500 in Visa gift cards and a $1,794 New Balance gift card! Plus, there are some great daily prizes being given away – including Amazon gift cards! ENTER SWEEPSTAKES HERE – Amazon Sweepstakes page. If you don’t wish to play the trivia game, you may enter here. ENTRY LIMIT – Limit one entry per person and e‐mail address per day during the Sweepstakes Period, regardless of entry method. ELIGIBILITY – If you are an individual legal resident of the 50 United States or the District of Columbia and are the older of 18 years of age or the legal age of majority in your state of residence at the time of entry, you are eligible to enter the Sweepstakes. The Sweepstakes is not open to employees or independent contractors, or immediate family members (spouses, domestic partners, parents, grandparents, siblings, children, and grandchildren) or those living in the same household of employees or independent contractors of Amazon Services LLC, the sponsor of the Sweepstakes, New Balance Athletic Shoe, Inc. (“New Balance”), Disney Worldwide Services, Inc. (“Disney”), Offerpop Corporation (“Offerpop”), any entity involved in any aspect of the Sweepstakes, and each of their respective parents, subsidiaries, affiliates, advisors, or advertising/promotion agencies. SWEEPSTAKES PERIOD – You may enter the Sweepstakes beginning at 12:00:01 a.m. (PT) on November 17, 2014 and ending at 11:59:59 p.m. (PT) on November 26, 2014. 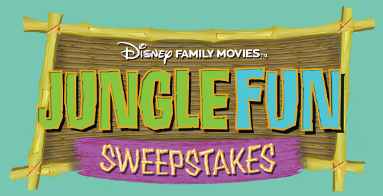 Disney Family Movies’ Jungle Fun Sweepstakes – Win a trip to Walt Disney World! 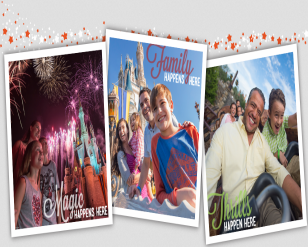 Win a trip for 4 to Walt Disney World & more! ENTER SWEEPSTAKES HERE – Disney Family Movies Sweepstakes page. You will need to sign in to your Disney Go account before you will be able to enter. ENTRY LIMIT – Limit one (1) Entry per person/per email address/per day during the Sweepstakes Period. ELIGIBILITY – Open to persons thirteen (13) years of age or older as of the date of entry who are permanent legal residents of the fifty (50) states of the U.S. and the District of Columbia (“D.C.”), (excluding Guam, Puerto Rico, and all other U.S. territories and possessions) who are physically located therein. Participants must have either a valid Social Security number or a valid U.S. personal tax identification number. SWEEPSTAKES PERIOD – The Disney Family Movies’ Jungle Fun Sweepstakes begins on April 15, 2014 at 12:01 a.m. Eastern Time (“ET”) and ends on May 19, 2014 at 11:59 p.m. ET. PRIZES – One (1) Grand Prize will be awarded: Grand Prize winner will receive a Walt Disney World® Resort vacation package for winner and up to three (3) guests consisting of: five (5) nights/ six (6) days at the Walt Disney World® Resort near Orlando, Florida; coach class air transportation for winner and up to three (3) guests from a major commercial airport near winner ‘s residence to Orlando International Airport, provided winner resides 250 miles or further from Walt Disney World® Resort; five (5) nights hotel accommodations consisting of (one (1) concierge level savannah view room/quad occupancy) at Disney’s Animal Kingdom Lodge at the Walt Disney World® Resort (selected by Disney in its sole discretion and subject to availability); four (4) round trip ground transfers between the Orlando International Airport and the Walt Disney World® Resort via Disney’s Magical Express Service; up to four (4) six (6) day Magic Your Way Tickets with Park Hopper® and Water Park Fun & More options; one (1) welcome Basket in your Walt Disney World®¨ Resort hotel room (awarded to the winner only); one (1) Walt Disney World® Resort Wild Africa Trek Guided Tour experience for four (4) persons. (Tour subject to availability, participants must be 8 years of age or older and at least 48 inches (122 cm) tall, and any Minor must be accompanied by a participating adult (18 years of age or older); one (1) Sunrise Safari Breakfast and Tour for four (4) persons (subject to availability); and one (1) Disney Gift Card with a value of one thousand dollars ($1,000) awarded only to the winner to use anywhere the Disney Gift Card is accepted. The total Approximate Retail Value (“ARV”) of the Grand Prize: $8,431.60. Five (5) First Prizes will be awarded: First Prize winner will receive one (1) character plush from the Jungle Book. ARV of the First Prize: $39.95.